This morning, Mayor Rahm Emanuel and CTA President Forrest Claypool officially unveiled the pilot bus for CTA’s new 7900-series Nova LFS. The event took place at CTA’s 74th Street Garage. Interior of the new 7900-series Nova LFS. CTA photo. Last year, the agency awarded a $148 million contract for the purchase of at least 300 clean diesel buses to Nova Bus. The contract contains options for the purchase of an additional 150 buses. This is the CTA’s second purchase of LFS models from manufacture Nova Bus. From 2000-2002, CTA received delivery of 484 Nova LFS models, dubbed the 6400-series. Those buses will largely be retired upon delivery of the new models. While the new Nova LFS buses may at first glance look similar to their outgoing predecessors, Nova Bus has made several key changes to the LFS model compared to the previous generation. Most notably, an updated horizontal engine placement eliminates the awkward interior seating layout at the rear of the bus. The new model also eliminates any rear-facing seats, an element that CTA explicitly prohibited as part of the procurement process for this order. One of the most dramatic changes in the interior of the bus is an improved LED-based lighting design. First the first time in a CTA bus, rows of lights now span across the aisle in addition to the traditional rows of lights along the sides of the bus. A new bulkhead design along the driver’s side of the bus provides for increased vertical clearance. 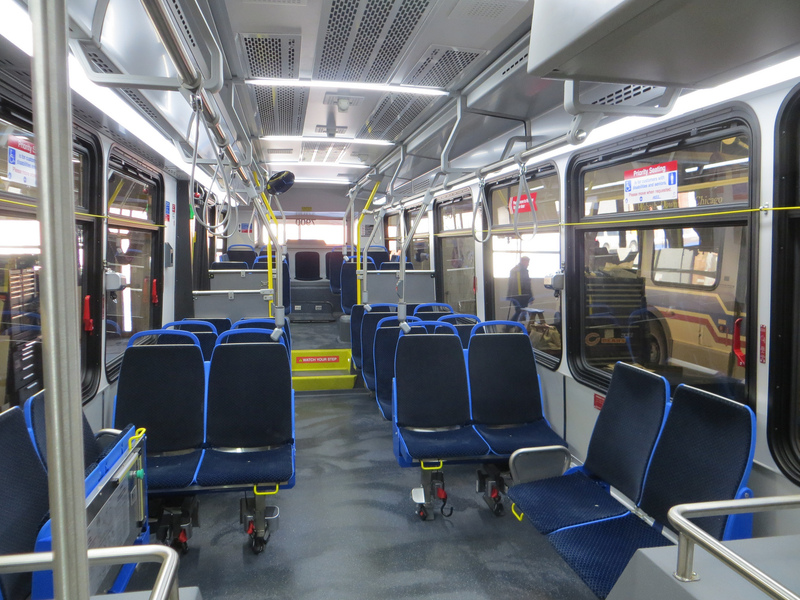 A new slate gray seamless floor design replaces the deep blue grooved flooring that CTA has traditionally used in its bus fleet. The floor design is similar to the floors on CTA’s 5000-series railcars. The 7900-series Novas also feature new lightweight “Gemini” seats from Chicago-based Freedman Seating Company. The City and CTA have previously touted the partnership with the local company, which the CTA says has resulted in 50 new jobs. The CTA expects to take regular delivery of the new Nova buses in April through the end of 2015 and, upon inspection and acceptance, begin putting new buses into service by May 2014.